We’d love your help. 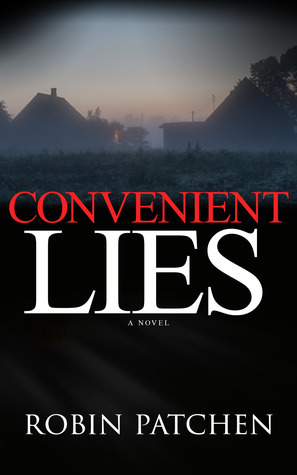 Let us know what’s wrong with this preview of Convenient Lies by Robin Patchen. When investigative journalist Reagan McAdams discovers her new husband Julien is part of a powerful international crime family, she flees Paris with their newborn, returning to her childhood home in Nutfield, New Hampshire. She plans to gather her inheritance, collect her beloved grandmother, and disappear forever. She’l What happens when a woman marries her greatest enemy? When investigative journalist Reagan McAdams discovers her new husband Julien is part of a powerful international crime family, she flees Paris with their newborn, returning to her childhood home in Nutfield, New Hampshire. She plans to gather her inheritance, collect her beloved grandmother, and disappear forever. She’ll do whatever it takes to protect her son from his criminal father. But when Reagan arrives home, her heart breaks at the news of her grandmother’s death. Finding her missing inheritance—hidden somewhere on the property—is as impossible as a second chance with her former boyfriend, Brady. Reagan’s feelings for Brady are stronger than ever, but when Julien’s people harm innocents to smoke her out, Reagan must make a choice. To ask other readers questions about Convenient Lies, please sign up. Has anyone read the rest of this series? As much as it pains me I can’t but rate this as is, and it all boils down to momentum. In broad strokes, the story is about, Reagan, a woman with many secrets, who decides to run away from Paris and from her hubby, Julien. In tow is their brand spanking newborn. Well, Reagan, you see, discovered that Julien was not who he portrayed himself to be and not only that, she also had information that linked him and his family to terrorists activities. She heads back to the US and lands in her New Hampshire hometown, where she immediately reacquaints with, Brady, her high school BF and first love. At this point, Julien had discovered her disappearance, and knowing she can’t ever leave and most certainly not with his son, he embarks on a retrieval mission. What he doesn’t know is that most, if not all, of Reagan’s backstory had been no more than carefully orchestrated lies which makes finding her near on impossible. All of the above transpired before the halfway mark, however, and sadly, the story then sputtered into redundancy; with the subsequent 40% revolving around a permanently tearful/crying Reagan, a fearful and inept Brady, and a hungry baby. Between feeding the baby and the crying by Reagan and the lukewarm pseudo love connection with Rea and Brady, the story never gains any meaningful arc. Eventually, and only at the very end, we glimpse a rather lackluster resolution to the conflict, all wrapped up in a deus ex machina bow. Overall, quite underwhelming. In a suspense novel, I'm looking for a pager turner and plausibility. Convenient Lies was most definitely a page turner and I was engaged in the story from the beginning. There was one point that I'm not sure if it was realistic or not, but it could be so will tip the scale in that direction. Main character Rae is trying to find a better life for her and her son. The path to getting there is incredibly dangerous and risky. She is a tough lady. My gratitude to the author for a complimentary copy of In a suspense novel, I'm looking for a pager turner and plausibility. Convenient Lies was most definitely a page turner and I was engaged in the story from the beginning. There was one point that I'm not sure if it was realistic or not, but it could be so will tip the scale in that direction. My rating 5+ out of 5 stars. There are authors who can tell a good story and there are those who tell a story in such a way it leaves readers wanting more. Readers can tell too if a book isn’t worth reading. Robin Patchen is more than a story teller! In Convenient Lies, she drew me into a world where secrets were kept for a variety of reasons, and lies were told as easy as turning on a light switch. When the main female character, Reagan McAdams, searches out and finds the truth, her world begins spinning out of control. On top of that her newborn son is the one thing that will make her “husband” continue chasing her around the globe until he retrieves his only heir. So, Reagan goes to the one person she believes will help her take care of a baby while being on the run. What Reagan doesn’t expect is her past catching up to her at the same time. Who can she trust? I found myself constantly reading and turning pages as the suspense never seemed to wane. The intrigue and danger with nefarious characters made the tension of the story very palpable for me. The budding romance and dealing with past issues while trying to stay a step ahead of danger was another thread that kept pulling me deeper into the book. Readers of suspense, international intrigue, tension, romance, mystery and the fight for justice will have hours of pure enjoyment reading Robin’s novels. I found too that what one character as she grew older thought she wanted ended up bringing her great heartache and danger. I loved too how the thrill of reading the story never let up. In fact, as soon as I was done reading this book I wanted to read her next novel in the series. The characters continue from one book to the next, the sequel, which is available now and titled, Twisted Lies! I sure hope the author has another novel planned as I want more stories with these characters that are filled with hours of engaging entertainment! The author quickly drew me into the story line, and kept things moving, all the way through. I thought I "knew" how it might end; but in this truly suspenseful novel, I was wrong! It is full of well-developed characters, some of which face danger. Romance is included, too. I look forward to the next book in this series! This is a scary scenario and I loved the book. I wasn't sure how the author was going to wrap it up and there is a surprise to how it ends. I give my approval. So if you suspense, drama and sudden twists and their are several of them, you are going to enjoy this book. Let me tell you, don't start this book thinking you'll read a couple of chapters and lay it down and go to sleep. No siree. I started it at 8 p.m. and at 11:30, I'm thinking, I really need to go to sleep...just one more chapter...and that turned into The End at 12:40 a.m. So be warned. Convenient Lies drew me in immediately. The book opened with Reagan McAdams taking her twelve-day-old baby and fleeing her husband. I had to find out why. Then I had to find out if she would escape his reach. And Let me tell you, don't start this book thinking you'll read a couple of chapters and lay it down and go to sleep. No siree. I started it at 8 p.m. and at 11:30, I'm thinking, I really need to go to sleep...just one more chapter...and that turned into The End at 12:40 a.m. So be warned. What do you get when you cross a desperate lady running for her life and a detective who still carries a flame for her? You get suspense, intrigue, romance, drama, and an edge of your seat thriller. In this story you met Rae who decides to go on the run with her newborn son once she discovers she has married a terrorist. But what do you need to live life on the run - money. So her journey begins in her hometown where she hopes to find some gold coins her father had hidden years ago to fund her l What do you get when you cross a desperate lady running for her life and a detective who still carries a flame for her? You get suspense, intrigue, romance, drama, and an edge of your seat thriller. In this story you met Rae who decides to go on the run with her newborn son once she discovers she has married a terrorist. But what do you need to live life on the run - money. So her journey begins in her hometown where she hopes to find some gold coins her father had hidden years ago to fund her life on the run. While there, she crosses paths with an old beau Brady who is a police detective. Brady can tell something is going on with Rae but she refuses to tell him anything as she is worried for his life. Rae knows her husband will stop at nothing to find her and their son. So Rae is forced to choice between confiding in Brady and protecting him. This is just when the drama heats up as several bombings make it clear to Rae that her husband is desperate to find them and is closing in. But Brady wouldn't just leave well enough alone, he keeps drilling her for information and as they spend more and more time together, the old flames of romance begin to bloom once again. But can their be any future for them with Rae on the run from her husband. Can Brady come up with a plan to help Rae in time. How many lives will be lost in the process? Is there any hope in this hopeless situation? Convenient Lies is an edge of your seat book. It grips you from page one and keeps you engaged right up to the exciting end. Reagan McAdams is married to Julien who is an international arms dealer. They have a two week old baby, Johnny. Reagan learns Julien is engaged in activities that are illegal and immoral. She takes their son and leaves him. She returns to the home of her grandmother with the intent of going into hiding. She knows it is a matter of time before Julien or his very powerful fa Convenient Lies is an edge of your seat book. It grips you from page one and keeps you engaged right up to the exciting end. Reagan McAdams is married to Julien who is an international arms dealer. They have a two week old baby, Johnny. Reagan learns Julien is engaged in activities that are illegal and immoral. She takes their son and leaves him. She returns to the home of her grandmother with the intent of going into hiding. She knows it is a matter of time before Julien or his very powerful father finds her and Johnny. When she returns home, she learns her grandmother has passed away. She is also reunited with her Brady, the man she has never stopped loving. She is also reunited with her friend, Samantha. She does not want to be around them because she fears for their safety if Julien finds out she has associated with them. But Brady is not willing to lose Reagan again and will stop at nothing to protect her and Johnny. Meanwhile, Julien is intent on finding Reagan and bringing her back home. He needs his son, his only heir, to return home as well so that he may take over the family business. Julien employs many methods to locate Reagan. As Reagan realizes she is endangering the lives of others by remaining on the run. She is forced to make tough decisions to protect Johnny. All her plans are changed when she receives a call from Julien and he is at her home with her son. The action starts right on the first page. I immediately liked Rae and wanted her to be able to get away from Julien. I was pulling for her to be able to make a home in New Hampshire through out the whole book. I was afraid she was going to panic and run away and be on the run looking over her shoulder for the rest of her life. The tension in this book is perfect. It is paced just right. Quite a few twists I didn't see coming. I love it when that happens! If Romantic Suspense is y I loved this book! If Romantic Suspense is your genre, then this is the book for you. It is a stand alone book. I can't say if you need to read this one before you can read the next book since I haven't read the next book, Twisted Lies, yet. I can't wait to get get the other two books in the series. In Convenient Lies, Robin Patchen delivers a story of a small town girl caught up in a dangerous international crime family. What Reagan thought was love has turned into control. When her son is born she knows his future is at stake and she runs home to the only people who might be able to help her. The story is tightly woven, the action fast paced, and the characters are multifaceted. You'll be on the edge of your seat long before you reach the final page. A fast-paced terror-filled book that will hold you spell-bound! When Rae finds evidence that her husband has not been honest with her and goes completely against what she holds true, she takes her baby and runs. From Tunis to Paris to the US, Rae runs to protect herself and her baby from the terrorism that shows itself in his father's family. This book will hold your attention from the first word until the last word. This is the first book by Robin that I've read and not my typical genre, I was engrossed by the first chapter. Loved the storyline and the characters were well developed. Definitely recommend it. Looking forward to reading more by her. A real page turner. Throughly enjoyed it. Fantastic! A real page turner, could not put it down. Page turner! I couldn't put it down until I reached the end. Quick-paced novel filled with suspense. Loved the emotional aspect of it. There were some typos that I found quite a bit annoying which lessened my enjoyment, but the plot was worth my reading on. There were also parts of the story that was confusing, and to travel so far and in such circumstances with a 2-week old is hardly realistic. But still, I enjoyed the romance, thriller, crime and action. A Book club choice. I have never read anything from this author before and I don't usually branch out into the mystery genre. I didn't love this book, but I didn't hate it. Rachel Adams or Rae left home to travel the world and become a reporter. She has only one living relative. Her grandmother lives in New Hampshire and Rae doesn't often speak with her. Rae married Julien Moreau. He swept her off her feet. Then the controlling behavior started and a baby, Jean-Louis (Johnny). Rae is able to plan A Book club choice. I have never read anything from this author before and I don't usually branch out into the mystery genre. I didn't love this book, but I didn't hate it. Rachel Adams or Rae left home to travel the world and become a reporter. She has only one living relative. Her grandmother lives in New Hampshire and Rae doesn't often speak with her. Rae married Julien Moreau. He swept her off her feet. Then the controlling behavior started and a baby, Jean-Louis (Johnny). Rae is able to plan an escape. She secretly takes the baby and herself to her grandmother's house in Nutfield, New Hampshire. Now we have a case of a woman on the run. Brady Thomas is Rachel's ex-boyfriend from her high school years. He has never forgotten her...he is still in love with her. Rachel doesn't plan on seeing anyone from her past. She planned on hiding inside and visiting her grandmother. However, she finds that her grandmother has died and there have been a number of break-ins at the house. Brady is a local police officer and is called out to the house about the break-ins. He discovers Rae there. "We waited for you to contact us, but when you didn't- Did you try and find me? He leveled his gaze at her, the frown familiar. I gave up trying to find you about eleven years ago. She returned his glare, then looked away. her reasons for cutting Brady out of her lfe all seemed so silly now. So Gram? When you didn't show up... He shrugged. She'd already planned and paid for her funeral. She's in the cemetery." Meanwhile, Julien is trying to piece together where Rae may be. His two cronies are Hector and Farah. Farah is in love with Julien. Hector and Julien have known each other since they were boys. As I continued on with the story, Rae started to get on my nerves. She is selfish. She is prideful. She is desperate but unwilling to accept help from others who freely offer it. Then, as though forced, she accepts their help. Overall, the other members in my book club were intrigued by the spy and espionage. Although the book wasn't totally about that, it does include a bit of detective work and running from evil men. This book is not a who done it but it does have a bit of mystery as to what happened in Rae's life to bring her to this point. The characters offer up some great talking points. How people can make really bad choices and not be monsters at the same time and how our decisions effect others. Although Rae got on my nerves towards the end of the book, she was an okay character. The book is told through Rae, Brady and Julien's eyes. It was interesting to see the world through Julien's POV. Convenient Lies, written by Robin Patchen, is book one of Hidden Truths Series. It was one of those books that you feel kind of bad for the characters because anyone with any integrity knows that y Convenient Lies, written by Robin Patchen, is book one of Hidden Truths Series. It was one of those books that you feel kind of bad for the characters because anyone with any integrity knows that you just can't go around lying and have a happy life. These characters could be anyone as so many people lack integrity and faith so much in their lives that they fall into the assumption that they can get away with one lie that leads to another and so on. This author doesn't have faith on each page, but by showing what one is like without it in their lives it shows their need of a Savior. Will keep this author at the top of my list for suspense! I was given a copy of this book by the author. All thoughts and comments are my own. Rachel Adams may not have been completely honest with her husband when they married—but he definitely had not been honest with her. Rae had changed her name when she left her hometown of Nutfield, New Hampshire and went to college—leaving a past behind her. Now, truths have come to light and she needs to get away and start over...again. Brady Thomas has returned home to Nutfield. He's been through some tough times, but survived. What he's not sure he can survive is having Rae back home. Especially since she's just planning on leaving again—like she had done twelve years ago. A great story. This is told from three separate point of views. The author has done an excellent job of keeping the story moving and building emotions and letting the reader see the different sides of the characters. It's hard to describe the uniqueness of it without spoilers. Investigative journalist Reagan McAdams wakes up one day to discover her secure Paris life is an illusion. Her husband is not who she thinks he is, and she's married into a dangerous international crime family. She flees with her newborn to her hometown of Nutfield. She plans to take her inheritance and disappear with her grandma and son. Only when she arrives, she finds her grandma has recently passed away, her deceased parents had secrets, and, once again, nothing is as it seems. When her high Investigative journalist Reagan McAdams wakes up one day to discover her secure Paris life is an illusion. Her husband is not who she thinks he is, and she's married into a dangerous international crime family. She flees with her newborn to her hometown of Nutfield. She plans to take her inheritance and disappear with her grandma and son. Only when she arrives, she finds her grandma has recently passed away, her deceased parents had secrets, and, once again, nothing is as it seems. When her high school sweetheart, officer Brady Thomas, re-enters her life, she feels safe for the first time in years. Are things, again, an illusion? Or is her life finally falling into place? This is a good book based on relationships where the truth was so well hidden that a young woman with a two-week old baby sneaks away from the baby's father and his criminal empire in the hopes of saving her baby from a similar life, a horrible secret kept from her until her professional investigative talents help her discover the truth on her own. The settings are interesting and partially international. I very much like this author's writing style--she is very good at depicting her characters' This is a good book based on relationships where the truth was so well hidden that a young woman with a two-week old baby sneaks away from the baby's father and his criminal empire in the hopes of saving her baby from a similar life, a horrible secret kept from her until her professional investigative talents help her discover the truth on her own. The settings are interesting and partially international. I very much like this author's writing style--she is very good at depicting her characters' emotions--and highly recommend this book if you enjoy the kind of suspense that makes you back off from reading and take a breather for a few minutes every now and then. If you like international intrigue with a strong romantic element, this is the book for you. It's got danger, a handsome hero, a perplexing villain, a body count, and a heroine you'll be cheering on throughout the book. Reagan McAdams returns to her old home, and her old name. Fleeing Paris with her infant son, she arrives at her grandmother's house only to learn that the dear woman passed away days ago. Her husband has lied to her, her grandmother has left her, and her high school boyfriend is t If you like international intrigue with a strong romantic element, this is the book for you. It's got danger, a handsome hero, a perplexing villain, a body count, and a heroine you'll be cheering on throughout the book. Convenient Lies is an action packed thriller by Robin Patchen. I love how the author dealt with a difficult situation-a small town girl who marries into a criminal family-but is determined her child won't be raised in that environment. I also liked the portrayal of the villain and those closest to him. I can't say more without giving away spoilers, but I'm excited to read the next installment in the series. Although I can say I enjoyed reading this book, it was fast paced and emotional but some bits were confusing, i.e. the reference to Walter/Nate (explained later on as the same person but had to wait for this to occur). There were also some typos which detracted from the reading enjoyment and a bit of incredulity on my part of being able to travel that far with a new born baby. The ending of the book is well worth reading though.